We have the need for a contract 3D Max script writer for a 3D project we have in development. Merry Christmas and Happy Holidays to all and thank you for visiting ScriptSpot! ToolTip was incorrect on the animation controllers. Animation wasn't keyed on the explosion, when the animation coller tick box was off. EDIT: Fixed the saveOutput Bug. Anyways the instructions are in the .rar file attached. I usually have the situation where I don't sure about the features suggested by the community members, so I think, some sort of voting system for the script features would be very usefull. This may be implemented in the forum topics, or in the script page. The latter would be more convenient. 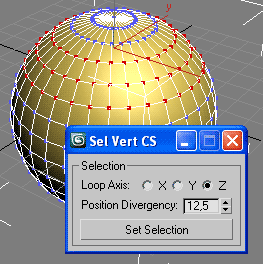 Extend 3ds Max selection features on Editable Mesh and Editable Poly. Max.NET is a .NET CLR wrapper for 3d Studio Max's (3dsmax) software development kit (SDK). It allows developers to write tools for 3dsmax in a managed and reflective environment using any of the common .NET languages such as C#, VB.net, J#, and C++/CLI. Moreover it provides access to all of the classes and their members accessible to normal unmanaged SDK. "Here at Blur we've developed a way to integrate the Python (http://www.python.org) programming language into the 3d Studio Max application. By mapping the basic MAXScript value class to the basic Python PyObject class, we're able to expose MAXScript functionality as a Python module. All maxscript methods are available using the mxs module and run the same way as they would normally in maxscript, only using a pythonic syntax. For faster development, we've also integrated the PyQt framework to allow development of Qt applications instead of MAXScript rollouts." Amazing news for those of you looking to make the switch to Python. "We have developed a way to run Python as a complete replacement of Maxscript in 3dsMax, utilizing Python and PyQt to develop tools, we're hoping to revolutionize the ability to develop fast, efficient and powerful utilities.